Recently since Alts were on a crazy run I thought there will be a correction for Alts and Bitcoin may start pumping in. We all know what happens when the king wakes up and roars. If you don't know it means the Alts will start bleeding heavily. So I converted all my alts to Bitcoin and cashed out a little FIAT as well. Today I woke up and opened this screen on Binance. If I had invested in any of these tokens in the last three days I could have cased out twice the amount. So my strategy for next 30 days is all in Altcoins with stoplosses. I will just distribute my profits on all the good project listed on Binance. In my next post I will explain how to use stop losses. 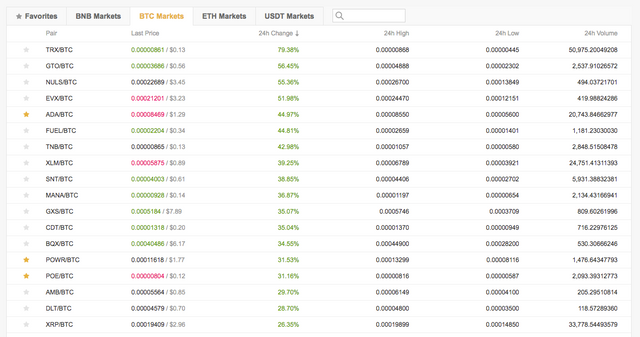 Of late Binance has been loaded with new users and trades have increased considerably. So that the site is going down couple of times or is becoming unresponsive for the popular coins. If you are facing such issue take a look at Kucoin which is an upcoming exchange. I am currenlty reviwing this exchange and will come out with a post shortly.